Buy the Farm . . . Share: I Sure Like Those Sports Games! Are you ready for some footbaaaaaaaaaall? Well, me neither. However, it is an excellent excuse to prepare a bunch of unhealthy "game time" foods! Now, are you ready for some football? Alright, let's get reaaaaaaaaady to ruuuuuuuuuumble! 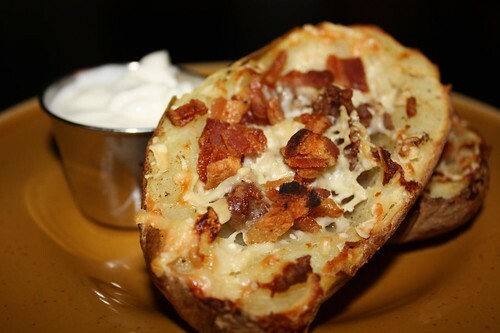 I started off by making potato skins with sweet Italian sausage, Gruyere Surchoix, and some crispy bacon. The Gruyere Surchoix may be a little too nice to melt over a potato with bacon and sausage but the end result was well worth the price of potentially wasting a fine cheese. For the second course I made Buffalo wings. They say marriage improves your memory because the other half of the partnership is able to recall things that you cannot and vice versa. This was proven tonight when I could not remember the last time I'd had Buffalo wings. Jen reminded me that the last time we'd had Buffalo wings was a few years ago and coincidentally the last time we'd had Papa John's pizza (or any takeout pizza for that matter). The result was us both feeling quite sick, likely because the pizza (75% cheese, 25% sauce and dough) was truly heinous. It was a moment that turned us both off to takeout pizza for, apparently, the rest of our lives. 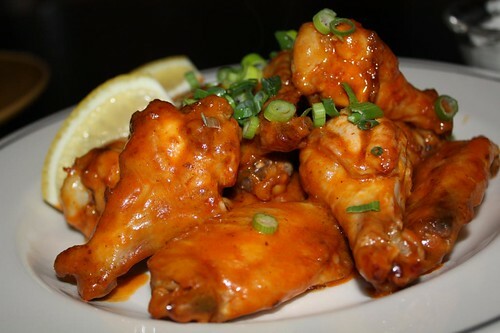 I prepared the sauce for the Buffalo wings in the same pan that I used to cook the crumbled sausage and render the bacon because I'm lazy which nicely deglazed the pan of all the pork flavor and infused the wings with a little extra pizazz. Which brings us to the pizza that I made for the final course. 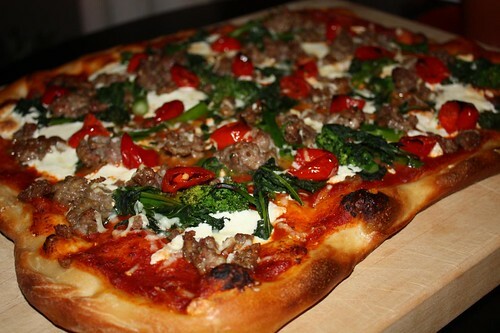 I used some more sausage, mozzarella, Gruyere Surchoix, broccoli rabe, and Peppadews. At least I think Peppadews is the plural for Peppadew. This is not one of the words that they go over in English class like shrimp or ox. Incidentally, shrimp and ox are both underutilized game time foods. Upon further review, to keep in the football genre, if the last Buffalo wings you had were from Papa John's, then you didn't really have Buffalo Wings. You might need to go back further in your miind. Yeah, I guess it doesn't really count as pizza either. Overall it was a sad, sad meal that day.